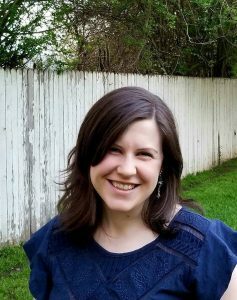 I’m excited to welcome Sarah Ashwood to Magic Writer! She’s here to tell us all about her new release, Aerisian Refrain. Elise: Welcome to Magic Writer! Readers may be familiar with your first Aerisia series. How does this new series relate to it? Sarah: Great question! This new series could be considered a follow up series to my first trilogy, the Sunset Lands Beyond trilogy, as the first book, Aerisian Refrain, takes place just a few years after the close of those books. It also contains many of the same characters. In fact, Beyond the Sunset Lands will be a four book series where each male MC is a side character from the original trilogy. The two series are very much connected, but (there is a but) I tried to write Aerisian Refrain in such a way and with enough information that Beyond the Sunset Lands can serve as a standalone series. So far, beta readers who haven’t read the first trilogy have had no trouble following along, so hopefully I’ve been successful. Elise: And what’s the inspiration behind Aerisian Refrain? Sarah: A few things. I enjoyed the male MC, Cole, so much in the first Aerisia trilogy that I wanted to tell his story. Also, in this new series, I wanted to take a closer look at some of Aerisia’s unique races and their worlds. 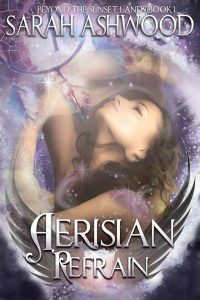 Aerisian Refrain delves heavily into the world of Aerisia’s fairies, their mysteries, and their magic. Lastly, I wanted to explore a connection between music and magic, so I wove all of these elements into this book. Elise: It’s always great fun to explore a world further! What was the hardest part about writing it? Sarah: Truthfully? Having my oldest in first grade and my middle child in Pre-K and choosing to homeschool both of them. Trying to find enough hours of the day to write, homeschool my kids, keep up with the house and my toddler, get in a daily workout, and all the other things stay-at-home parents have to do was not easy! Elise: No, that sounds like you had your work cut out! How long have you been writing? What’s your next writing project? Sarah: I’ve been writing for 15 years now. I actually wrote the rough draft of my first Aerisia trilogy when I was 18 years old. It’s been through many, many revisions since then, but the original storyline has stayed the same and continues to inspire more books. 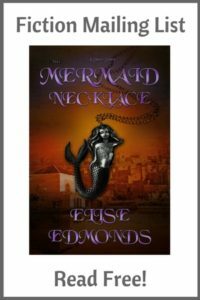 Elise: That sounds like it will be a fun read–I like fairytales. When you’re not writing, how else do you enjoy spending your time? Sarah: My favorite hobby, besides writing, is fitness. I mainly workout at home because of the kids, but Beachbody on Demand and a huge library of fitness DVDs allow me to do basically any kind of workout in my own house. Kickboxing is my favorite. I am also a runner, and that is something I like to do outside the house whenever possible, as opposed to using the treadmill. Besides those, I enjoy a little hand quilting, playing the piano, baking, and, of course, reading. Elise: Final question: if you could meet one author, alive or dead, who would it be and what would you ask them? Sarah: Oh, Shakespeare, for sure. I would ask him how he felt about having such a profound affect on the English language! If you ever look into how many words and phrases we say every day that stem from him and his writing, it’s truly astounding. I can only dream of having a legacy like that. Elise: Great choice! Thanks for stopping by.